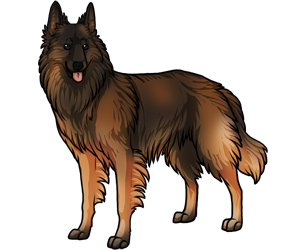 The Belgian Tervuran shares the same stock as the three other Belgian breeds, the belgian Groenendael, Malinois, and Leakenois, and was developed in the late 1800s. The breed was originated from a group of people who gathered stock dogs from several areas of belgium and bred them to create the belgium shepherd. In 1959, the AKC recognized the Balgian Tervuran as a seperate breed from the other Balgian shepherd varieties. Today, all belgian varieties are used as working, sport, and companion dogs. The Tervuran and other Belgian Shepherds are still recognized under one breed standard under the UKC. The Belgian Tervuran was the first of the four variety of Belgian Shpeherds to be distinguished by type.